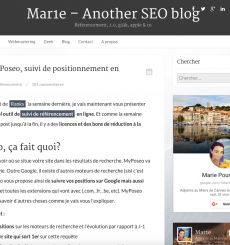 You are BLOGGER and you would like to propose a test or a review of Myposeo? On this page you will find all the information you need to write your article and organise a draw to offer tests and licences to your readers. If you have a site or blog on which you want to share the discovery of our tool with your readers, you will find on this page all the information you need to write your article. The benefits for YOU ! Myposeo is a limited free tool that does not allow testing on all features. This is why, we can provide you with a specific account so that you can perform tests in a suitable environment. To obtain this advantage, your blog must be located in one of the following topics: Marketing and e-marketing / E-commerce / Affiliation / SEO / Sponsored links / Web development / etc. It is very interesting to be able to discuss with your readers the use of a tool that you have tested. That’s why we propose to you to organise contests to offer Myposeo licences or tests of the tool to your readers. Each request related to the writing of your article will be analysed. So that your site or blog can get visibility and that your readers are satisfied. Here are some topics that you can address in order or in a completely random way. Of course you are free to propose your own plan. Discovery and familiarisation with the tool: how did you discover it and could you simply star using it? Interesting data and information: which KPIs you were of particular interest to you? Here are some of our blogging partner. If you have some influence in the web and would like to join our program, please do not hesitate to contact us. Become a Myposeo partner and let your future customers benefit from interesting offers and discounts on their first order. Become partner school of our student program and give your students FREE access to the online tool for 1 year.